Mom Taxi Julie: Almonds Anyone?? Here in the Central Valley where I live we have tons of almond orchards. And they are putting more in every day. Today I saw this on the way to work. I was hoping it would still be there on the way home so I could snap a picture of it and it was! 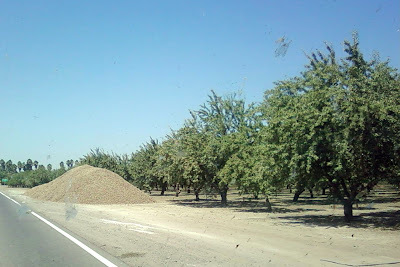 So here, you have the biggest "pile" of almonds I've ever seen on the side of the road. (actually I've NEVER seen them on the side of the road like that, it's kind of weird). And YES it IS Almonds. Think of that pile next time you go to the grocery store and pay $5 for a little can of almonds. BTW, do you say ALL-monds or AM-onds? It's like a sin to say ALL-monds around here if you are a farmer. They ALL say AM-onds. Weird. We say "Ahh - mins" ... lol! Say do you think anyone would notice if you filled your trunk? then you could have the great almond giveaway on your blog, and since I thought of it I should automatically win some ROFL!!! I'm not a big nut fan but that is a BIG pile. Around here we have tons of fruit trees. Lots of my patients have pomegranate trees and they have tons of them. My kids had never tastsed pomegranates so I went to the store and bought a few and found out they cost $3 each. Next time I'm getting them from my patient's trees, lol. that is amazing! i love all-monds... i would have stopped and filled the car! Well unless you cannt see the "L" or its one of the those weird silent L's i say aLL-mOnds...or hell I call them salty flat nuts that look like footballs...and yes by the way I say Foot-bass....because the L is silent.